And here it is, my last swimwear blog post for this summer (yep, it's half way through Autumn already, I know). When I first made the Ottobre Seamus trunks for P and they were too baggy, I put the pattern aside for a bit while I sewed A's swimmers. Then one morning he was riding to school in the Nature Walk shorts I'd made him 2 years ago. They're made of an athletic knit and are now kinda tight and resemble cycle shorts. It occurred to me I had my perfect boy's swim trunks pattern right there in front of me all along. 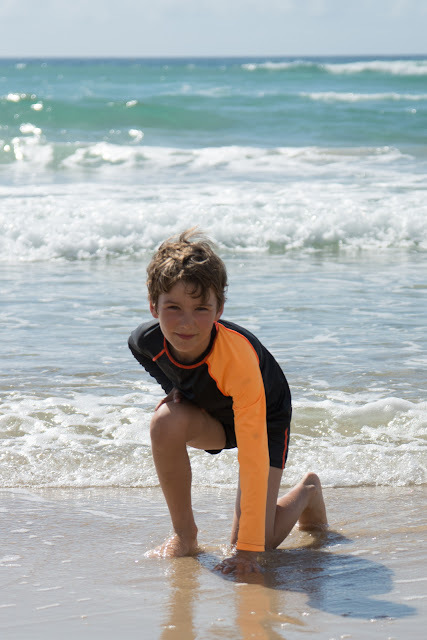 And so, I'm over at Oliver + S showing how I've used their patterns to create beachwear. Until Liesl gives us the long wished for swimwear pattern this is as close to Oliver + S swimmers as I can get. I decided to make the swim trunks a bit more interesting by splitting the pattern pieces to allow for some colour blocking and the faked flatlocked seams. I toyed with the idea of inserting a short, exposed zip at the back neck, but decided it wasn't necessary so why bother. Instead I just added about 1/2" width to the neckband pattern piece to give it a slightly higher neckband and left it at that. With the neckband sewn on with the overlocker and then twin needle stitched down it has plenty of stretch to get over his head without needing a zipper. The charcoal grey fabric is a mystery textile that was purchased out at Eliza fabrics. It's definitely synthetic, has four way stretch and one shinier side, so I'm calling it lycra, but who knows. It's thinner than the orange dancewear lycra/spandex that came from GJ's fabrics and I expect it will wear out first. But the way this kid grows I don't expect more than season from his swimwear anyway. Both the shorts and the T-shirt are made two sizes down from where his measurements would put him. Of course I had to add some length to the t-shirt and considerable sleeve length. I think it may have been as much as 4 extra inches of sleeve length - the kid has long arms! The good thing about a raglan sleeve is that you can measure from collar to wrist and that's the sleeve length you need. Easy to get right. He loved the beach and enjoyed riding his boogie board and catching waves. It amazed me that even though this is probably the most well known and commercialised bit of coast the whole way around Australia, and even thought the high rise apartments come right down to the sand, the beach still felt almost empty. Not empty by Aus standards, but certainly empty compared to any well known beach in any other part of the world. After we got back from the Gold Coast I realised it was A who needed a rashie as hers had been very faded, worn and saggy. Of course that meant she needed a pair of swim trunks to match it, so I set about "girlifying" the Nature Walk pants to suit her. This is at a much less glamorous, colder and generally less photogenic bay beach in Melbourne and I hadn't expected the kids to go in, but once they see water there's no stopping them. I made the neckband on her top a bit wider again, adding a full inch to the pattern. Thus the folded neckband is 1/2" wider than intended. It works for a rashie, but is right on the limit to my taste. I think it would be visually far too thick and chunky for a regular t-shirt. Her shorts were drafted to have an extended side section which is then drawn up and ruched by virtue of a casing and drawstrings. The casing is done in much the same was as this skirt which I adapted and photographed for another Oliver + S tutorial here. Making this set exactly used up the remnants of the floral lycra from The Fabric Store (used here) and another of the small remnants I'd picked up at GJ's. These are now her favourite swimmers which is kinda funny since I simply cannot convince her to wear shorts or pants in any other situation. If it ever warms up here (snow in the forecast) swimmers and rash guards are next on my to-sew list. It never occurred to me to use Nature Walk and Field Trip patterns for swimwear. Thanks! You children's "swimming costumes" as my old British auntie calls them, look terrific! I'd love to make a proper "swimming costume" as in a elbow and knee length onesie with a zipper up the front. In a nice stripe it would very vintage and cute! Glad to have given you some inspiration for patterns you already own! 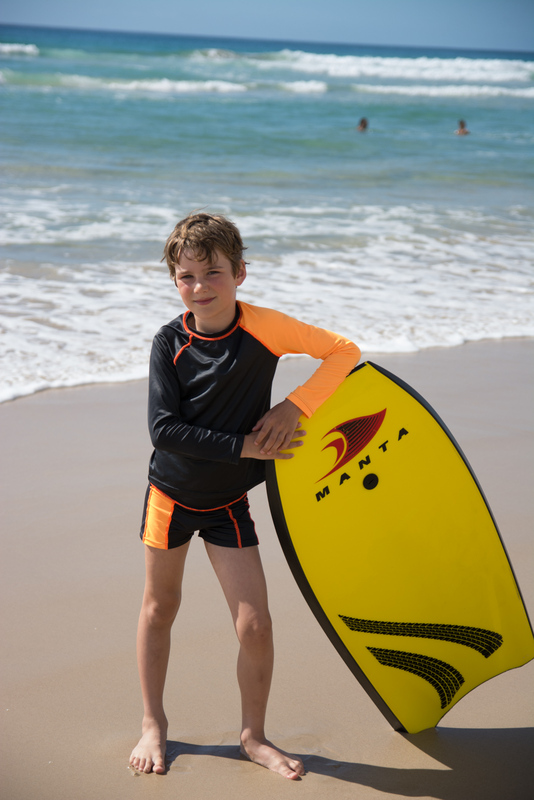 I'm so glad to see this, as I just ordered fabric to make my older boy a trunk and rash guard set for the summer (and I was planning to use the Field Trip pattern for the rash guard). I really like the one orange sleeve - it looks like something you'd buy at a fancy children's boutique. Thanks Masha, I wouldn't have had enough for two sleeves anyway so it was a happy accident. I look forward to seeing yours! You my friend, are a flipping genius! These look incredible. Well done! And you're the sweetest. Thanks Katy. This is seriously impressive! Both are so cute.... um, and handsome! :) I love the floral you chose! It is beautiful! And what is it with kids and cold water?! In Waldorf education, they say that kids have an underdeveloped sense of their internal thermostat. Based on my experience raising my own five children and observing children in general, I think there's something to that. (Disclaimer: I do recognize this is anecdotal!) :) The whole "natural consequences" thing never works for us. They'll go in cold water until their lips are blue and their teeth are chattering. Children... sigh! Ha ha, only if it's"fun" water. Get the temperature of the bath/shower wrong by as little as 1 degree and they complain non stop! I think P must be part Arab, he just never seems hot and will wear long aleeves/pants right through summer. In winter he rugs up like he's in the Artic! Totally fantastic!! The Nature Walk Pants! Of COURSE! So awesome!! Thanks Inder. The Nature Walk pattern is like the dorky genius kid that everyone forgets to notice! lids really don't care about going into cold water, do they? Our daughter would have done the same! I used to have a "hero" thing about swimming in any water any time. So long as it was liquid, nit solid it was warm enough to go in! P's modelling cracks me up, but I love him for it. I give him almost no direction. He's obviously picked up that there's smiling for Granny type photos and then not smiling at the camera blog photos. Love him! Whereas A tends to prance, smile, pout and "perform" which makes it much harder to get nice clothing pictures. Still, at least they both oblige me, hey. PJ looks very professional in his rashie and shorts and love the style of Miss "A" girly but keeps you covered.